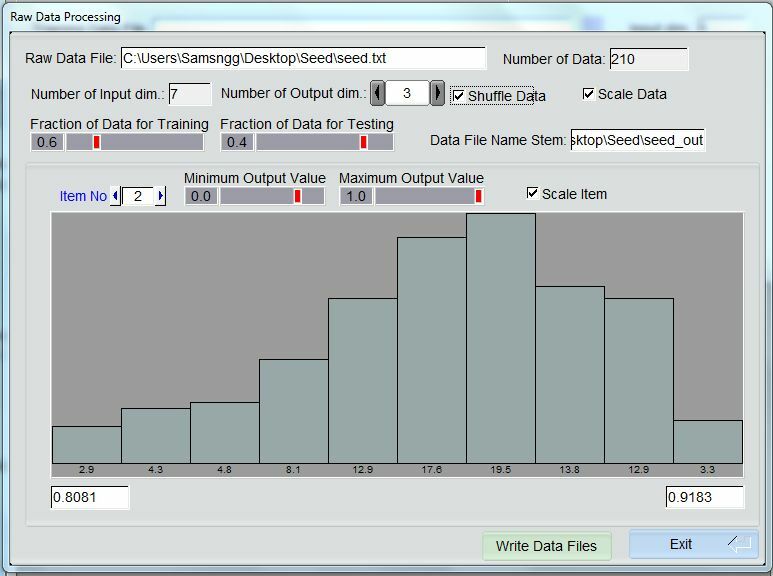 Methods based on kernel density estimation have been successfully applied for various data mining tasks. Their natural interpretation together with suitable properties make them an attractive tool among others in clustering problems. 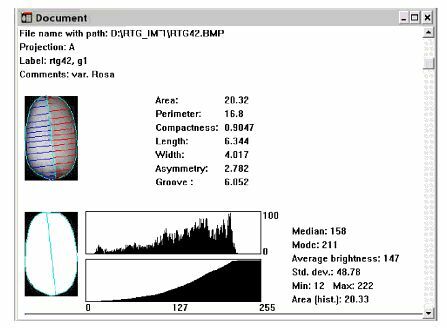 In this paper, the Complete Gradient Clustering Algorithm has been used to investigate a real data set of grains. 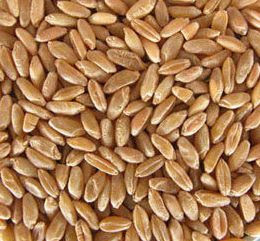 The wheat varieties, Kama, Rosa and Canadian, characterized by measurements of main grain geometric features obtained by X-ray technique, have been analyzed. 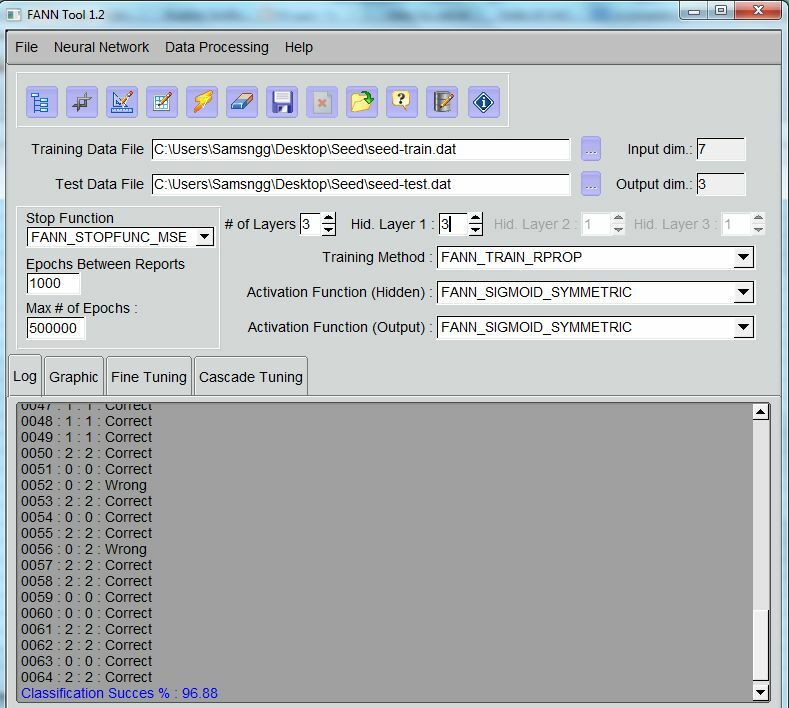 The proposed algorithm is expected to be an effective tool for recognizing wheat varieties. A comparison between the clustering results obtained from this method and the classical k-means clustering algorithm shows positive practical features of the Complete Gradient Clustering Algorithm. X-Işını tekniği dedikleri bir metodla çektikleri görüntüler üzerinden çıkardıkları özniteliklerle, "Complete Gradient Clustering Algorithm"kullanılarak sınıflandırma çalışması yapılmış. Biz bu çalışmanın veri setine The UCI Machine Learning Repository den ulaştık. The examined group comprised kernels belonging to three different varieties of wheat: Kama, Rosa and Canadian, 70 elements each, randomly selected for the experiment. High quality visualization of the internal kernel structure was detected using a soft X-ray technique. It is non-destructive and considerably cheaper than other more sophisticated imaging techniques like scanning microscopy or laser technology. 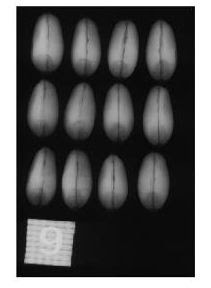 The images were recorded on 13x18 cm X-ray KODAK plates. Studies were conducted using combine harvested wheat grain originating from experimental fields, explored at the Institute of Agrophysics of the Polish Academy of Sciences in Lublin. 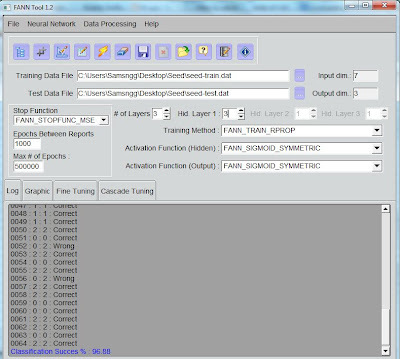 The data set can be used for the tasks of classification and cluster analysis. All of these parameters were real-valued continuous. Bu veri setini FannTool'u kullanarak YSA ile sınıflandırmayı deneyeceğiz. Artık yapmamız gereken şey Eğitim ve test verilerini yükleyip. YSA için değişik yapılarda ve değişik eğitim algoritmaları ve paramtereleri ile denemeler yapmak.